The defence mechanism of plants differs markedly from animals − plants cannot choose ‘flight’ if they decide not to fight. For plants, the choice to fight back often comes at the cost of growth and development. Now, a new study by Ashish Nandi and colleagues at the Jawaharlal Nehru University (JNU), Delhi and the Indian Institute of Science, Education & Research, Thiruvananthapuram (IISER-TVM) describes a new mechanism by which plants make this decision to either defend or grow. Immune response in plants takes the form of cellular signaling and reactive oxygen species (ROS) generation. This leads to a hypersensitive response involving programmed cell death which then restricts pathogen growth and survival. However, this exaggerated response also exerts a cost on the host plant cell growth and development. Thus, plants have to decide when to react, and when to stop, for their own survival. Nandi’s team discovered a new player in this story − a gene called polycomb-group repressor MEDEA (MEA). This is an imprinted gene of which only the maternal copy is expressed in the female gametophyte and endosperm. Normally, this gene remains repressed during the vegetative stages of the plant. But, the researchers encountered a curious observation − pathogen-challenged leaves of Arabidopsis plants expressed MEA. “So, we started with a curiosity, why do plants express a gene like MEA in leaves, where it is never expressed?” says Nandi. 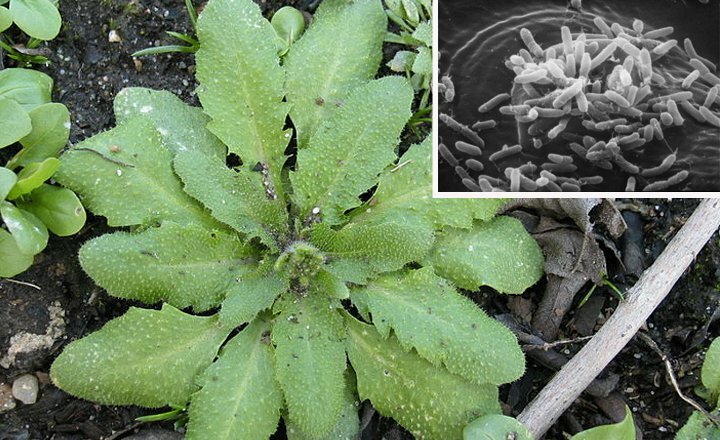 The researchers were surprised to find high levels of expression of this usually silenced gene in leaves within six hours of attack by a pathogen (Pseudomonas syringae). To investigate this further, they studied what would happen if they deliberately increased the levels of MEA using genetic tools. Interestingly, plants which had enhanced levels of MEA had reduced immunity − they supported more bacterial growth and displayed increased disease symptoms. These results suggested a feedback loop between MEA and immune response where exposure to pathogens could increase MEA levels, and enhanced MEA levels could reduce the defense response. The researchers next studied the molecular basis of this feedback response. The immune response in Arabidopsis towards Pseudomonas syringae requires the function of a gene - RPS2. Nandi and colleagues found that MEA along with another transcription factor directly targets this gene and represses it. Repression of RPS2 leads to repression of the immune response towards the bacteria. So if MEA is normally suppressed during the vegetative states, how does the pathogen attack remove this repression? The silencing of MEA is brought about by two ways: DNA methylation and di- and tri-methylation of histone3 at lysine 27 (H3K7). The authors show that although DNA methylation was still present at the MEA locus, there were reduced levels of di- and tri-methylation of H3K7. Apart from its effects on H3K7, the pathogen also activates the expression of MEA by increasing the tri-methylation of a different site (lysine 4) on the histone H3 protein. These findings may have important field applications. “Having a proper knowledge of plant immune response is essential for better management of diseases of crop plants,” says Nandi. Did you enjoy this article? Please comment below to let us know your views. Surat completed her PhD in life sciences from Tata Institute of Fundamental Research (TIFR), Mumbai in Jan 2016. She is currently working as a freelance science writer and editor. Is an invasive species equally harmful at home?